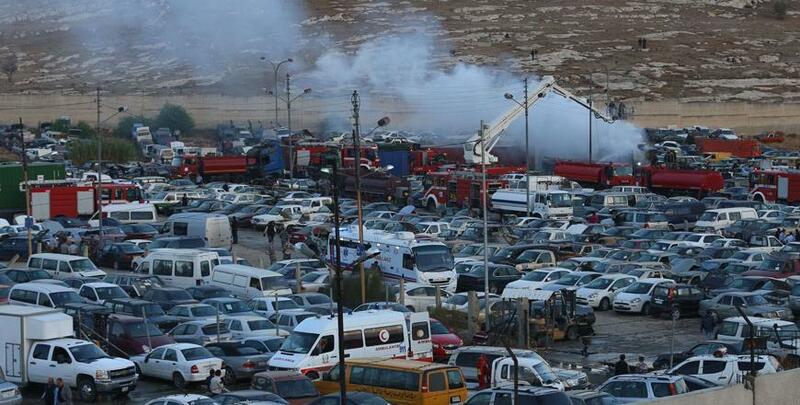 AMMAN – Eight people were killed and 12 others injured Monday in a "huge" fire at the Jordan Customs Department (JCD) yards in Abu Alanda area, southern Amman, according to the Civil Defence Department (CDD). An officer at the media office of the CDD said the fire erupted after two containers of fireworks exploded, adding that the dead and the injured were workers at the yards and were Jordanian and Egyptian. The CDD officer told The Jordan Times over the phone that several vehicles parked at the yard were damaged by the fire. Prime Minister Abdullah Ensour visited the location of the fire on the same day. After firefighters extinguished the blaze, Ensour held a meeting with Interior Minister Salameh Hammad, Public Security Department Director Maj. Gen. Atef Saudi, CDD Director General Lt. Gen. Talal Kofahi, and JCD Director Munther Assaf, and ordered the formation of an investigation panel to find out the reasons behind the fire, according to the Jordan News Agency, Petra. Hammad, Minister of State for Media Affairs and Communications Mohammad Momani, and Minister of Health Ali Hiasat visited the injured at Al Hanan and Al Bashir public hospitals in Amman, Petra reported. Hiasat said one of the injured was in critical condition, while the others were in moderate to fair condition. Importing fireworks was banned by the government in 2009, except for those brought into the country by public agencies for national festivities. But a government official told The Jordan Times that the containers were seized by customs officers several weeks ago and were stored at the yards before being re-exported to Nigeria. Referring to the fire’s causes, Assaf said the way the container burned can only be explained as the result of “carelessness” by the unloading workers, stressing that the storage location was far away from any source that could have led to the fire, a statement issued by the JCD said. He said that JCD would get rid of other seized containers of fireworks as soon as possible to avoid similar accidents in the future.